So I decided to run a random BG before going to bed last night, hoping for maybe a quick AB or even SotA. Instead, I got IoC. Coming off an IoC weekend, I was already pretty sick of that BG, but it is a good source of Honor Kills if you can get a good group. I was hoping we would kill High Commander Halford Wyrmbane and get it over with, but noticed that no one was assaulting any of the bases. “Great, another turtle match,” I thought and almost left the group. It didn’t take long for the HKs to start spamming my screen, so I decided to stay and wait it out. We didn’t “turtle” per se, as they were not able to take any of our walls down, but we did manage to win by depleting all their reinforcements. Got my 100 Conquest Points and a bunch of HKs, what more can you ask for? 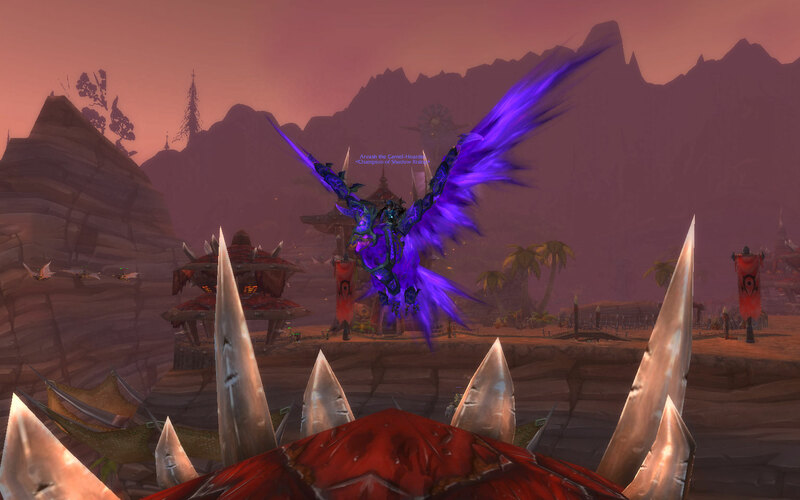 So last night, SR decided to finish up some Firelands achievements to get our purple birdies. Most of us had a couple left to do, mainly Death From Above and the Brushfire part of Do a Barrel Roll! We had 8 people on: Ado, Fahalala, Cayle, Liyhe, Lyssianna, Vanicus, Notari and me. For Death From Above, I ended up tanking all three drones, not killing a single one, while the group burned Beth down. 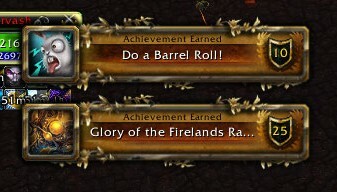 It took us three tries for Do a Barrel Roll!, but we did work and got it done. 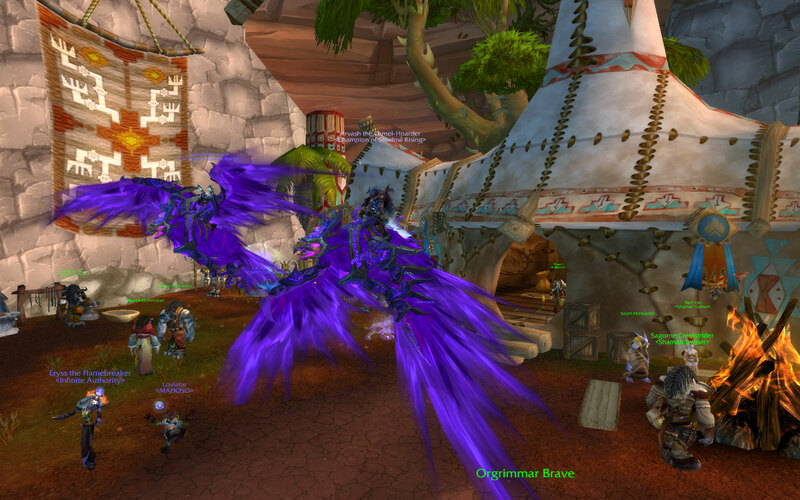 The achievements may have came late in the expansion, but we got some pretty sweet mounts for it! 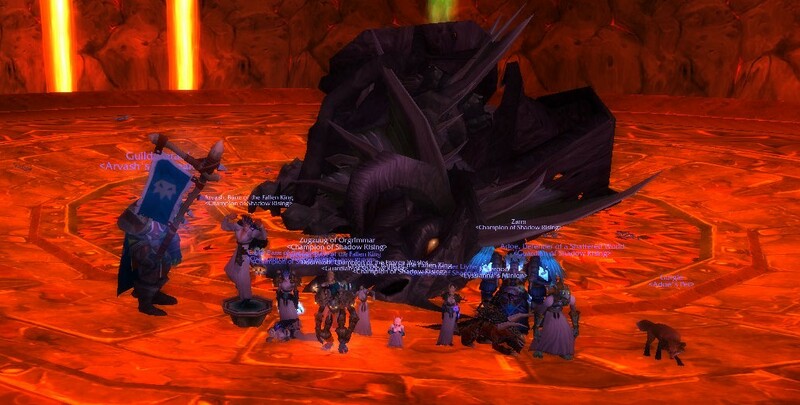 Thanks guys for a great run and grats on the mounts! I’ve been a video gamer all my life, most of it on consoles. I can remember the day when my parents bought us our first NES system. My brother and I played the crap out of that. We would play RC Pro-Am, Excite Bike, Mario, Tecmo Bowl and many other games all day along. We played so much that we became Masters of Making the NES Game work, which included such techniques as the Slide-the-Cartridge-Just-Over-the-Lip-then-Push-Down technique, the Bang-the-Side-or-Top-of-the-Machine technique and the one the never seemed to fail for us, the Blow-the-Cartridge-Under-your-Shirt technique. My first RPG was Final Fantasy and I played it with my strategy guide and map all out on the floor while my little sister watched, wondering what the heck I was doing. Super NES, Sega Genesis, Sega CD, Game Boy…you name it, I’ve pretty much played it. Computer games at the time were a small facet of my gaming but I always favored the console more. I remember playing the Oregon Trail on those ancient computers in grade school, hunting endlessly for food, yet still ended up dying from starvation. At home, I killed baddies in Commander Keen, completed all the levels in the original The Incredible Machine and mastered the skies and took down planes in Aces of the Pacific. I guess it only made sense that I ended up working at a video game store and Best Buy throughout high school/college. I accumulated a lot of old systems and games while working there. I even still have the Sega Dreamcast with its Star Trek-esque controller (MvC2, FTW!). I spent endless nights and early mornings, grinding out deathmatches in Golden Eye, Perfect Dark and Halo. Definitely good times. 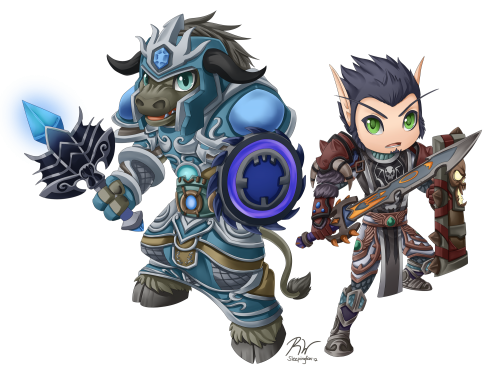 And then there was Warcraft. One day working at Best Buy, I noticed a Collector’s Edition of Warcraft III on the shelf. I read the description on the back the box and decided to give it a try. Boy, did I have a blast! You mean I get to command units and send them out into battle while fortifying my base? Sweet! I ended up getting The Frozen Throne expansion pack too when it came out, but unfortunately never finished either game. 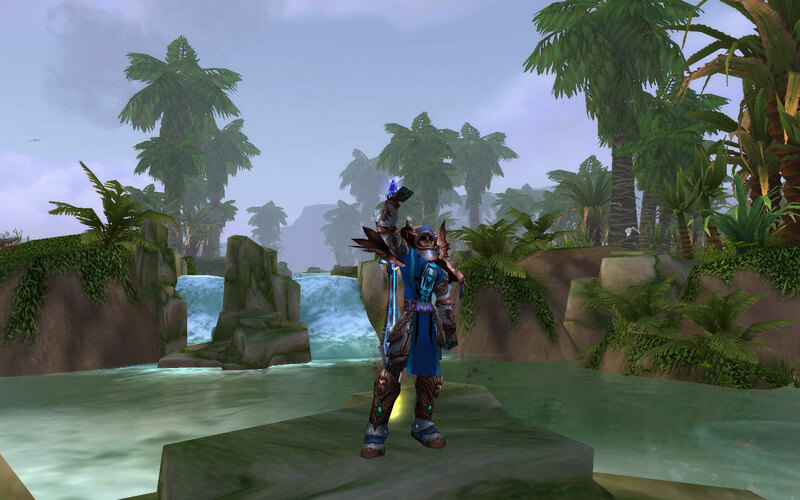 I enjoyed the Warcraft universe so much that even though I had stopped playing the PC game, I kept myself immersed into the comics, toys and trading card game. 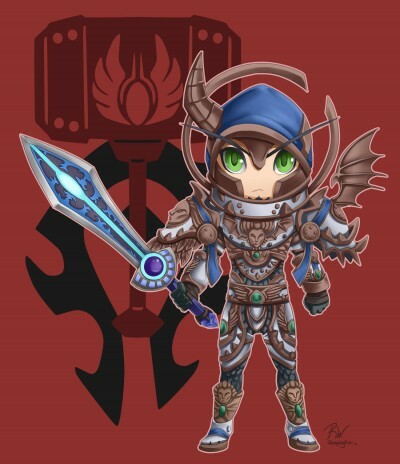 Then a RL friend of mine, Chewy (SR members will also know him as Stunnah), said if I had all this Warcraft stuff, why wasn’t I playing World of Warcraft? I really debated against it; I wasn’t interested in paying a monthly fee for a PC game when I was more into the console stuff. It took a while and lots of persuasion from Chewy, but I finally caved in. 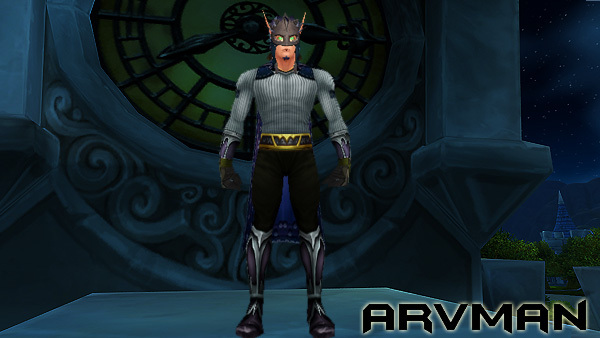 So I entered the world of Azeroth in August 2008, got immediately hooked and the rest is history. 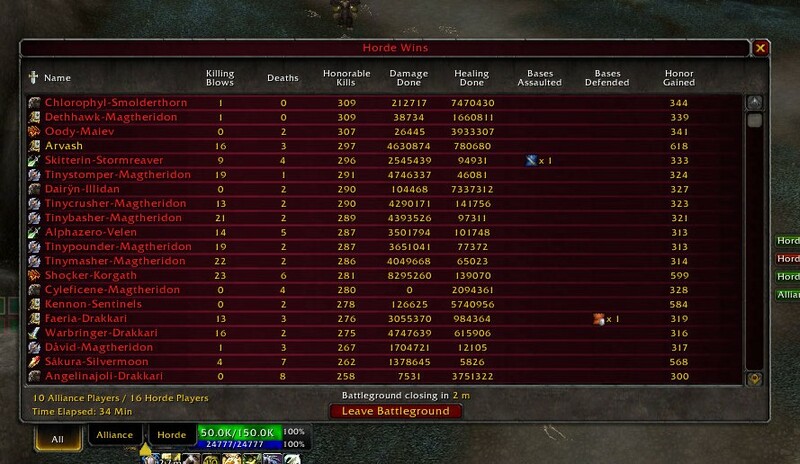 Today, I spend more time on the PC than I do on my Xbox 360 or PS3, mainly on WoW. I love playing the game, playing it with friends, meeting new ones, exploring it on my own and yes, even pvpeeing, lol. Looking forward to exploring Pandaria with my friends!